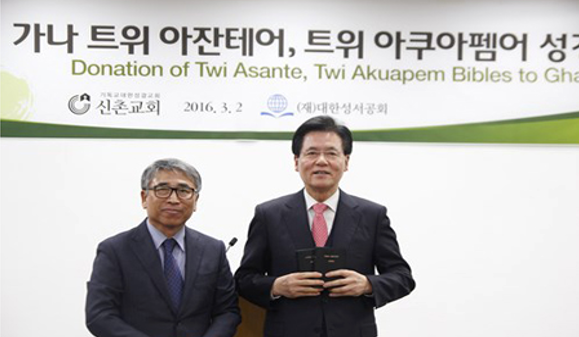 The Bible-Sending Ceremony was conducted at the Distribution Center of the Korean Bible Society on March 2, 2016. This event was attended by members of the Sinchon Evangelical Holiness Church that has supported the provision of 20,736 Twi Asante Bibles and 10,000 Twi Akuapem Bibles to Ghana. The Sinchon Church has been running the campaign, “Let’s Send Bibles to Ghana” since January as part of the church’s annual international mission program. Church members proactively contributed to the campaign, in the hope of bringing the Ghanaian family to salvation through the copy of the Bible that is delivered to one family. Mr. Eui Hyun Kwon, the President of the Korean Bible Society thanked the Sinchon Church for their action of love towards the greater Christian family in Ghana, and prayed for God’s grace and peace upon the Sinchon Church and its members. The Bible Society of Ghana will use these Bibles for the projects targeting the youth and marginalized women. The Bibles are expected to arrive at Tema Port of Ghana in late April.